The Dell PowerEdge M1000e with the M710 Blade Server gives IT Professionals and SMBs memory scalability and I/O flexibility, perfect for virtualization and workload consolidation within their datacenters. Aventis Systems offers the M1000e with the full-height M710 in partially populated configurations with 4 server blades, or fully populated configurations with 8 server blades. 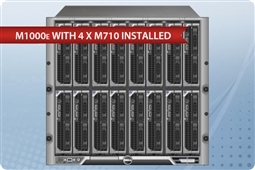 Dell M-Series blade solutions begin with the M1000e enclosure, a 10U enclosure, the M1000e performance dense infrastructure includes up to six Hot Plug, redundant power supplies, up to nine Hot Plug, redundant Energy Smart fans and one (redundant optional) Chassis Management Controller (CMC). Also, up to three fully redundant interconnect I/O fabrics (Ethernet, Fibre Channel, etc.) are supported together within the enclosure through up to six interconnect I/O modules. The Dell PowerEdge M710 Blade Server, with two Intel Xeon 5500 and 5600 product family processors, supports up to six cores and 12MB cache per CPU. An impressive memory footprint supports 18-DIMM memory capacity for a total of up to 288GB running at 1333MHz. Storage options include up to four SAS or SATA hard drives or solid state drives, giving excellent storage density in the enclosure, and Aventis Systems even includes the PERC 6/iR RAID controller standard with our M710 systems. Please browse our M1000e with M710 blades below! Aventis Systems carries Aventis Certified Reconditioned Dell PowerEdge M1000e with M710 Blades servers. All servers from Aventis System include a 3 year Comprehensive Warranty, with eligibility for optional Express warranties and onsite services. Please browse our Dell PowerEdge M1000e with M710 Blade Servers below for the perfect balance between storage density, performance, and value for your datacenter!